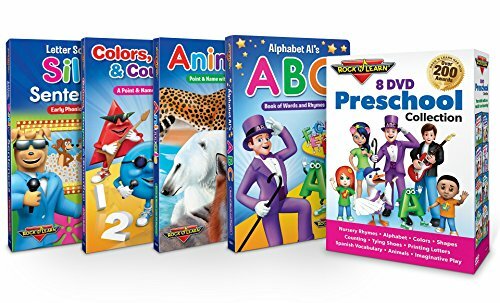 Preschoolers love learning with these 8 DVDs and 3 sturdy board books. The DVDs include video from our award-winning Dance with the Animals; Nursery Rhymes; Alphabet Exercise; Alphabet; Learn a Language - Numbers, Colors & More (Spanish) and Let's Play Outside (Spanish); Colors, Shapes & Counting; and Getting Ready for Kindergarten. The colorful board books allow kids to share with you what they are learning, especially useful before naps or bedtime. Three books are included: Colors, Shapes & Counting, Animals, and Alphabet Al's ABC Book of Rhymes. This value-priced set prepares young learners for school success.Skills taught: Nursery Rhymes, Alphabet, Colors, Shapes, Counting, Tying Shoes, Printing Letters, Spanish Vocabulary, Animals, Imaginative Play and much more. If you have any questions about this product by ROCK N LEARN, contact us by completing and submitting the form below. If you are looking for a specif part number, please include it with your message.